Saturday November 24th I will heading down to Derby NC for my 9th running of this wonderful little race put on by Mark Long of the Mangum Track Club. This is the only race that I have somewhat of a streak going. Bill Keane and I have both run 8 and the only person to have run all 9 previous versions is Tony Rouse. I was at that first year event but as a volunteer. 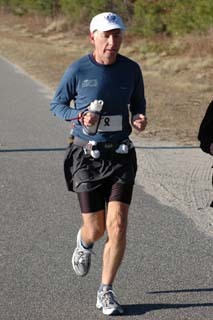 I was still a novice at ultrarunning and didn't feel I was ready to run another 50k at that time. I did at last get to run one lap with my friends Jay and Anita Finkle. Most years I have used this course to attempt a 50k pr. It is not an easy course with several hills on each of 3 laps but since it is a rare road ultra, at least it is faster than most other 50k's out there. I have usually run a pr here only to break it in January at Frosty 50k but last years attempt which I shared the first 20 miles with my friend Margherita ended with me blowing up halfway through the last lap. Nothing unusual there. I almost always blow up but each year I was getting a few minutes faster. A couple of other years I just ran for fun with friends including Karla's first ultra. I was kind of hoping to go for the pr once again this year but my previous schedule and the type of training I've been doing are not really geared toward having a great performance here. The pace I would hope to run is about the same I was hoping to run at OBX two weeks ago and that didn't work out too well. So I will just go and hope to have fun. If I find myself close to that pace after a few miles and I feel good, who knows? Maybe I'll go for it until I blow up again. You never know. It could happen. But I expect I'll be no where near that pace and if so I'll hope to find someone to run with for fun. I might end up running with Jenn. IF I can stay up with her. Funny thing is that I usually run lot faster than her at every distance up to 50 k but at 50 and 100 miles she has run faster than me. She just has one speed and doesn't slow down or blow up like I tend to do. Well, no matter how things turn out, I intend to have fun. Stay tuned ! Joey, best of luck at Derby! I will be down there manning aid station #1. See you there!